When it comes to fire protection, you can’t fall short. Protection should never be optional, and it can’t be seen as a luxury. When it comes to fire protection, you can’t fall short. Protection should never be optional, and it can’t be seen as a luxury. Unfortunately, many people believe they can skip out on comprehensive fire protection, because they believe a fire could never happen to them. But there are so many seemingly harmless things that could end up causing a deadly fire, regardless of whether or not you’re a commercial business or living in a residential neighborhood. So, what are the benefits of fire protection? Read on to find out. One of the most prevalent forms of fire protection is the sprinkler system. It’s something most people are familiar with, as they are very commonly used. Sprinkler systems can be both wet and dry. 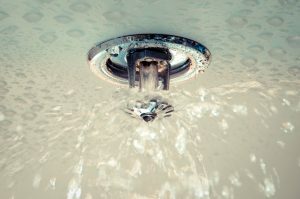 A wet sprinkler is the traditional form that sprays water when fire is detected. These sprinklers are hooked up to pipes, and are great for both residential and commercial areas. Dry sprinklers, however, holds pressurized air or nitrogen instead of water. This system usually used when the inside of a building must not be compromised by water. For example, a museum or library would benefit from a dry sprinkler system. Sprinkler systems require frequent maintenance. If the system isn’t regularly inspected by the National Fire Protection Agency, you could be fined for faulty fire protection. Also, a broken or inefficient sprinkler system runs the risk of failing to actually extinguish a fire–safety is compromised, and you would be operating under incredibly dangerous conditions. Luckily, Judd Fire Protection has 65 years of combined experience in working with all types of sprinkler systems. This means that we can use our training to not only install your sprinkler system, but also inspect it to make sure it functions safely. In most cases, fire alarms are an absolutely imperative part of a fire protection plan. Both residential and commercial buildings need to be prepared for the possibility that a fire could go unnoticed until it’s too late. If a fire catches in one meeting room, and there’s no fire alarm that will alert others in the building, people could get seriously injured due to lack of awareness. A fire alarm significantly prevents the possibility that a patron or resident will be left inside the building during an evacuation. Depending on your particular situation, your fire alarm system may be different than a neighboring resident or business. This is why it’s important to hire fire protection services who are heavily trained, like Judd Fire Protection. Your fire alarm may require strobe lights, a pull station, fire sirens, or heat detectors–regardless of the necessity, Judd Fire Protection can give you quality service and installation. Fire alarm systems also require frequent maintenance and inspections to ensure they’re working properly. Apart from fire drills, you can also have them professionally inspected and maintained to ensure that everything is functioning perfectly. You’ll want your fire protection to be in top shape so it’s ready for anything. Did you know that there are different classes of fire extinguishers meant to be used for separate purposes? It’s important to know the distinction between them. As part of a comprehensive fire protection plan, you’ll need a fire extinguisher on-hand at all times to put out fires on the spot. Building codes often require the presence of a fire extinguisher. Just like sprinkler systems and fire alarms, fire extinguishers require regular maintenance checks. The classes of fire extinguishers matter in regards to your specific situation. Judd Fire Protection will find the absolute extinguisher for you. Class A extinguishers are for common combustible materials like wood and paper, Class B is for flammable liquid fires, Class C is for electrical fires, Class D is for metal fires, and Class K is for grease fires. Choosing which fire extinguisher you need can be daunting; that’s why Judd Fire Protection is here to provide our expertise. Without maintenance, your fire protection system becomes virtually useless. If the system is running improperly and you aren’t aware of that, when a fire catches, you’ll be unprepared. Installing a fire protection system and forgetting about it means you’re wasting money and resources. Your patrons and residents are at risk when fire protection isn’t properly installed, and this can cause legal issues and injuries. To avoid this mess of a situation, call Judd Fire Protection for help. Our combined experience is more than enough to help you get started on an effective fire protection maintenance routine. We are certified by the National Institute for Certification and Engineering Technologies; this means we are capable of working with each and every fire protection system, in order to make sure it’s still functional and keeping you safe at all times. If we haven’t convinced you yet, perhaps it would interest you to know that these protection products can greatly reduce the risk of loss of property or life. It’s not sufficient to simply purchase your own hand-held fire extinguisher–what happens when there’s a larger fire? What about when your extinguisher isn’t the right class for the job? If you haven’t considered fire protection as part of your building plan, installation with Judd Fire Protection is easy and straightforward. We can make the process stress-free for you, and you can rest assured that you’re protected from any danger related to fire. Call Judd Fire Protection for more information on fire protection plans and system maintenance! Do you need maintenance or inspections done on your fire protection system? Are you worried that your fire protection isn’t enough to keep you safe? Judd Fire Protection is dedicated to helping you. We commit ourselves to four fundamental values: safety, honesty, service, and excellence. We were founded in 1992, and we have over two decades worth of experience working with fire protection installation and maintenance. We have a strong and trustworthy reputation that has built up over the years, due to our excellent service. We’re local, but our service range is wide enough to be useful to millions of people, which means saving millions of lives. Judd Fire Protection works within all of Maryland, southern Pennsylvania, Washington D.C., northern Virginia, and parts of West Virginia. Contact us today! You’re one step closer to reliable fire protection. Follow our blog for more updates, or you can follow us on [social media sites]. You can call us for 24/7 emergency service at 410-871-3480. This entry was posted on Friday, January 20th, 2017 at 11:42 am. Both comments and pings are currently closed.